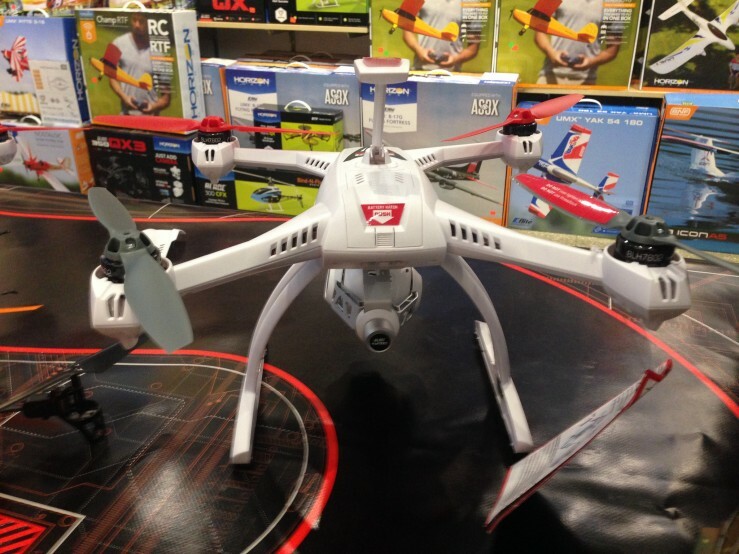 Pilotage, a Midtown Manhattan hobby shop sells off the shelf models like this one daily as drones have become more popular over the last year. Photo credit: Megan Jamerson. They buzz loudly like an enormous pesky mosquito, but unlike the insect, drones are fun to have around. With new easy to use off the shelf models ranging from 2 inches to 3 feet wide, drones are more popular than ever in New York City. Pilotage a Midtown Manhattan hobby shop and seller of model drones, has between 40 and 50 people a day walking in to purchase the popular remote control gadgets. “They call New York City the wild west of drone activity,” said Miguel Velez of the Bronx. Velez, the assistant manager of the store, said remote control drones have existed for many years now, but the technology of the new models has changed the atmosphere. Velez is constantly educating customers on the current FAA regulations. These include not flying over 400 feet and within a mile of airports. Also, Central Park is completely off limits, while designated flying fields like SRW in Brooklyn welcome drones. With the increase in popularity, violations have also been on the rise. In September, two men were arrested by the NYPD on reckless endangerment charges for flying drones at the Brooklyn Bridge and the U.S. Open of Tennis. The increase in violations has prompted the Federal Aviation Administration to announce they are working on new regulation for early 2015. “I think regulation is important in the same way gun regulation is important,” said Randy Scott Slavin, of Midtown Manhattan. Salvin a professional drone videographer, was one of approximately 20 that attended a recent gathering of the New York City Drone User Group in Orangeburg, New York. Members brought both off the self and custom made drones to the event. Some resembled giant mother boards, while others were sleek and compact. One of the attendees, Nina Tushevs works for the United Nations and teaches indigenous people of Peru, in the northern Amazon, how to monitor their rainforest with drones. She explained there are many uses for drones including for search and rescue, monitoring wildlife, and climate change research. “There’s a lot of potential to democratize this technology and I’m excited about that,” said Tushevs.